Q. Are high-end cables worth the money? 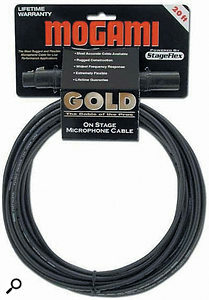 In a shop recently, I was almost persuaded to buy some Mogami XLR cables. The sales guys said that there's an audible difference between using cheap XLRs and high-end ones, but we didn't have time to test their assertion. Is there any truth in this? I understand that they might last longer — but can they really sound better? My main use in this case would be for feeding active studio monitors. SOS Technical Editor Hugh Robjohns replies: The short answer is no, they're very unlikely to sound any better. The longer answer is that there are complexities and subtleties involved that can, in specific circumstances, conspire to affect the sound when using different types of cables and connectors. Mogami cables are generally well made and fit for purpose (so you should have perfectly decent cables there!) but so too are a great many other branded and unbranded cables. I tend to make all my own cables, but if I have to buy pre-made ones I always look for genuine Neutrik connectors — I reason that if someone is going to the trouble of fitting those, the chances are they know how to choose a decent cable too, and wire it up correctly!